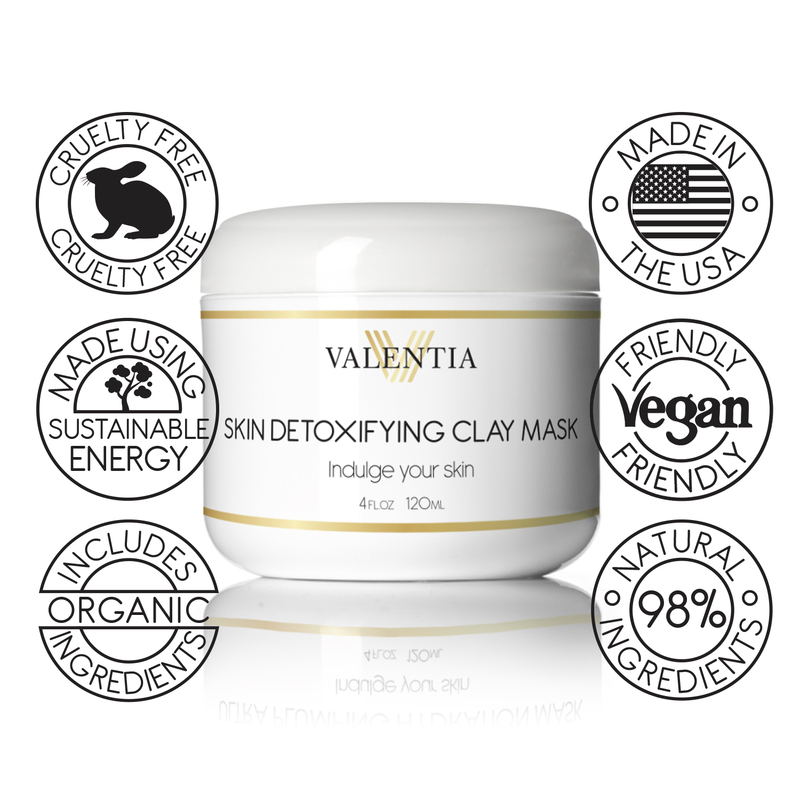 Valentia Skin Detoxifying Clay Mask - A natural kaolin clay and botanical based mask that gently removes excess, dirt and oil while deeply cleansing and exfoliating the skin to reveal softer, smoother skin. Valentia Eternal Youth Exfoliating Scrub- A refreshing scrub with green and white teas partnered with a trio of tropical butters. - Kaolin Clay: Clay minerals draw impurities, improve skin tone, and tighten pores for smoother firmer skin. - Plant Stem Cells: Naturally decreases the level of pro-aging toxins and works to soother the skin, reduce redness, and improve evenness. -Spirulina: A botanical stimulant full of vitamins that hydrates the skins surface and contributes to tissue regeneration of the skin. - CoQ10: Lessens the appearance of wrinkles by reducing free radical damage and stimulating health collagen production. - Hibiscus & Cranberry Fibers: Both lend their anti-aging properties to firm and reinforce the skin, helping to reduce the creation of new wrinkles. 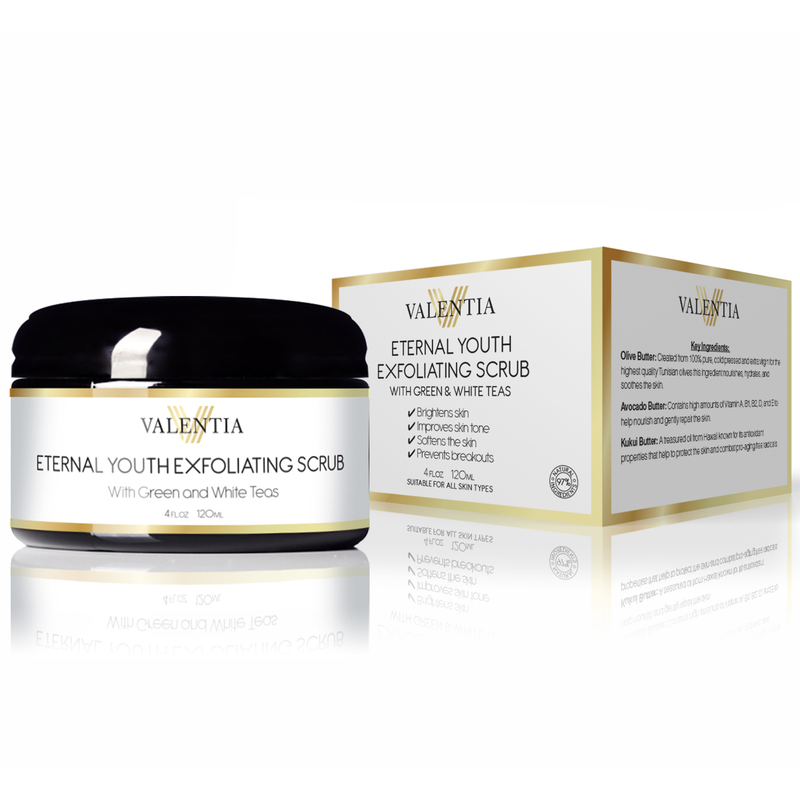 Valentia Eternal Youth Exfoliating Scrub:- Green and White Tea: Packed with polyphenols and potent antioxidants that provide anti-inflammatory, anti-irritant, and anti-aging effects. - Aloe Vera: This nutrient rich botanical moisturizes the skin and fights aging by improving skin firmness. - Jojoba Beads: Gentle beads that work to exfoliate and remove dead skin cells without scratching the skin. - Olive, Avocado & Kukui Butter:This nutrient dense trio is rich in Vitamin A, B, D, and E helps nourish, hydrate, and repair the skin while combating pro-aging free radicals.